Doan is looking for the PINK version of this elephant. 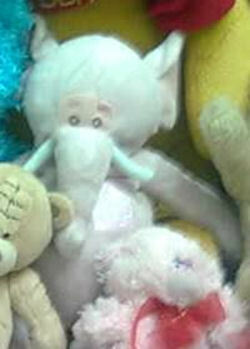 I’m looking for a pink elephant that has a rattle inside of it and a bow tie to its neck. It also has a square that says ABC attached to its front right. My mom bought this for me when I was young, and, with all the moving, I lost this sweetie along with a lot of other toys. I loved that elephant, and I would like to have it again as a memento of my childhood. I appreciate your help very much !!! Is this the blue version? Think this is the elephant in pink.